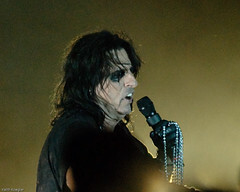 ■ Happy birthday to you, Alice Cooper, 70 years young today. And still looking as cadaverous as you did in the 70s! You might want to cut back on your driving, though. their hunger drives them on. I don't think the Proverbialist meant this in any metaphorical sense. In football, a touchdown happens when the offense advances the ball all the way down the field using its downs, and by either passing the ball or running, gets the ball into the end zone. A touchdown is worth 6 points, and is the object of much strategy by the entire team. On “Downton,” the focus of much of the characters’ lives is a suitable marriage, on which hangs the fate of entire families, great fortunes, and the plot of the whole show. It all makes sense, eventually. ■ At Reason, Tate Watkins is rightfully peeved at the self-interested rent-seeking moralism of a corporate behemoth: The Puffy Coat Makers at Patagonia Want You to Subsidize Their Rich Customers. "The President Stole Your Land." That was the message, in stark white letters against a black background, that replaced the usual bright-colored images of puffy jackets and backpacks on the outdoor retailer Patagonia's website last month. "In an illegal move," the text continued, "the president just reduced the size of Bears Ears and Grand Staircase-Escalante National Monuments. This is the largest elimination of protected land in American history." The pop-up was probably jarring for anyone browsing to buy a thermal base layer. It was also inaccurate. Even if the administration's monument reductions survive legal challenges, the area in question wasn't "stolen" from the public: It remains federally owned public land. Watkins notes that, generally, user fees cover only a fraction of the cost of maintaining unspoilt playgrounds for the well-off. The Rest Of Us pay for their E tickets. PolitiFact is a liberal “fact checking” operation that serves the Democratic Party by pretending to be credible and non-partisan. To further its mission of providing unbiased “fact checking,” it hired former Florida representative Alan Grayson, perhaps the most despicable Congressman of modern times. We haven't said anything about Alan Grayson in the entire history of Pun Salad, because he was too easy a target. The amusement inherent in pointing out an unhinged, lying, demagogue is limited. But Hinderaker has the goods, if you'd like to see them. But one more point is relevant: PolitiFact apparently set out to hire a Democrat and a Republican to join their “fact checking” team. The Democrat was Grayson; they are going back to the drawing board on that one. But the Republican was David Jolly, who, like Grayson, was briefly a Congressman from Florida. And Jolly is a "prominent Republican critic of U.S. President Donald Trump." Yes: Politifact's idea of even-handedness is to hire both Democrat and Republican Trump-haters. All news is economic news, because everything affects the economy, or reveals attitudes or behaviors that soon will affect it. And all economic news is bad — especially good economic news, because it gives rise to bad behavior. I like that. I don't know if it's true, but still. America—both its government and its citizenry—is fiscally imprudent. It's difficult to see how this ends well.